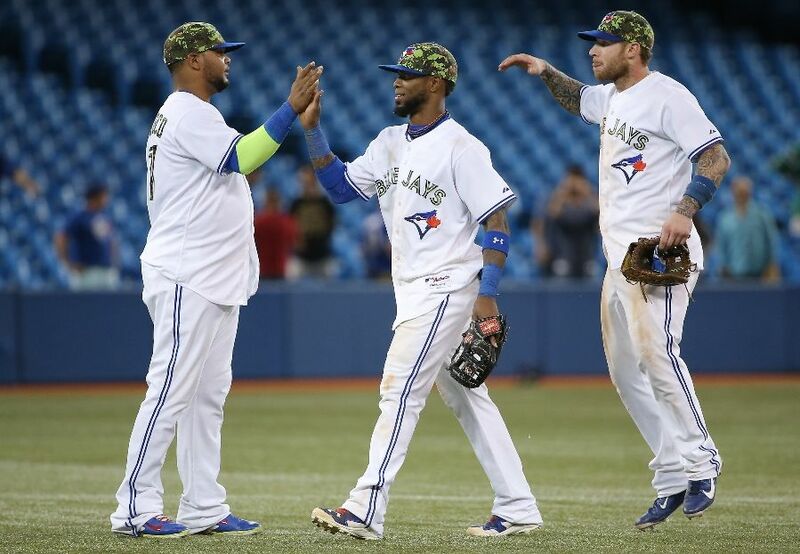 Blue Jays celebrated America’s Memorial Day by wearing their Canadian camouflage. During American holidays, all of Major League Baseball is decked out in special uniforms. Whether it’s the caps or jerseys (sometimes both), the teams will wear either a flag patch or a camouflage design. But on Memorial Day yesterday, it was a little strange. Since it’s an American holiday, it would have been odd for the Blue Jays to participate in the uniform changeup. But it had been promoted that the Jays would take part of it. But when the day arrived, the Jays did not wear that cap. Instead they used the Canadian (CADPAT) camouflage design instead. As you can see in the above photo, it’s green and completely different than what the rest of the league was wearing. Even though the Blue Jays had no reason to celebrate America’s Memorial Day, they still did it. But they didn’t wear what everyone else was wearing, they were wearing their own camouflage. For the American holiday, the Canadian team was forced to participate in some way. Was this to make the Blue Jays more American? Or was this simply because they didn’t want the Blue Jays to not fit in? Whatever it may be, it could ultimately come down to merchandising. Despite not advertising the right cap, the Blue Jays helped further the act of every team wearing camouflage. Surprisingly, the caps the Blue Jays did wear are not for sale online. A missed marketing opportunity. Regardless, this holiday forced this on us and we’re only left to wonder what they will do on Independence Day and 9/11. This entry was posted in Merchandise, MLB, New Sets, Toronto Blue Jays, Uniforms & Design and tagged Cash Grab, Memorial Day. Bookmark the permalink.